The faith of our Kashubian forefathers was very strong when they arrived from Kashubia and is still very strong today in Wilno. It was their faith that kept them going when times were tough and the first generation had it very rough. They came here as Roman Catholics. One of the main things the Kashubs needed to do when they arrived here was to build their own churches. 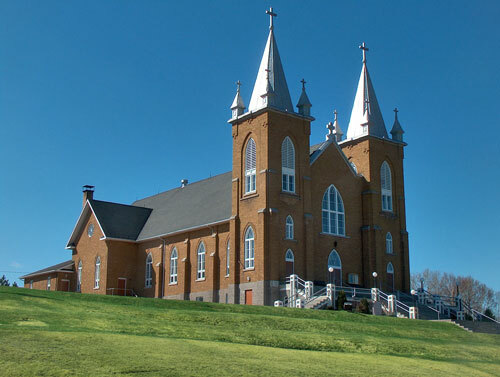 They built a small chapel in 1875 and then later built a church which they called St. Stanislaus Kostka Church. This church burned down in 1936 and a new church was built and named St. Mary’s Church. These churches were not built alone by just Kashub people. There were others who help build these churches. There was a small Polish immigration in the 1860s. The Kashubs made up 90% of the parishioners and the other 10% were Polish. The Kashub and the Polish had a great relationship and had many things in common, they were both Slavic and they were Roman Catholics. In their church, they share religious Icons and cultural elements from each other’s heritage. For the Kashubs, the most important one is a statue of the Blessed Mother of Sianowo, Queen of Kashubia. On Sunday May 8th, 2016, eighteen Kashubs from Kashubia, mostly from the parish of Sianowo brought this Kashubian icon and presented it to the parishioners of St. Mary’s. This event was supported by the St. Mary’s Rosary Society, St. Mary’s Knights of Columbus Council 16003 and the Kashubian Griffins Hockey Club, custodians of the Kashubian history in Canada. This Kashubian Icon was donated to St. Mary’s from the Parish of the Church of the Nativity of the Blessed Virgin Mary in Kashubia where the original statue finds its home. They also have the Lord’s Pray written in the Kashubian which was donated by the Kashubian Pomoranian Association in 2008 part of the 150 year celebration of the immigration of 1858. St. Mary’s also received a plaque of Pope John Paul II where it reads in Kashubian “Boze Pomagoj – na pamialka zendzenio u Krolewj Kaszëb, Swionowo ( Remember meeting Queen of Kashubia, in Sianowo), from one of their favourite priests, Fr. Wojtek Blach who visited Kashubia and the parish of Sianowo. Father Wojtek Blach experienced true Kashubian heritage when visiting the Kashub homeland of Kashubia. 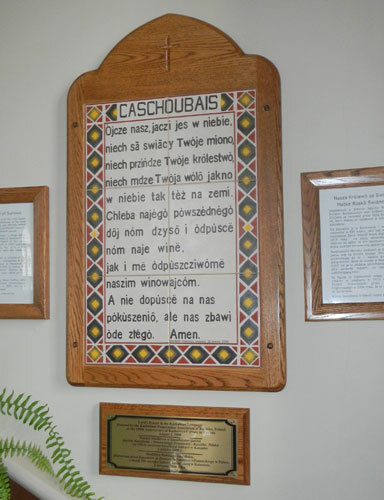 When immigrants from Kashubia / Kaszëbë settled in the Wilno area, they brought with them not only a rich cultural heritage, but also a deep religious tradition. They settled in some very rugged land. Travel was very difficult – road conditions were poor and journeys were long. Those settlers longed for a place to worship. There was no Catholic church close by. The nearest church was in Brudenell, built in the 1860's. It was near impossible for the pioneers living near Paugh Lake to make it to church in Brudenell. And even those living closer found that the terrain, the weather and the distance hindered their ability to worship in church. To satisfy their strong need to pray to Our Lord the settlers erected large wooden crosses at the intersections of main roads. This was a tradition they borrowed from the motherland. On Sundays and Holy Days the pioneers close to each intersection would gather at the crossroads and celebrate their Faith. These crosses were not used, however, for regular service. The prayer at the crosses was private prayer. Rosaries were recited and the appropriate Sunday litany was recited. The worship that occurred at the crossroads was a very special religious experience - different from attending church. Our forefathers here took nothing for granted. They had no communication, no reliable transportation and no secure income. Yet they were grateful for every step they took in life. And they thanked our Lord. It became tradition to make the sign of the cross when one passed a cross at an intersection. Gentlemen would remove their hats also. And not only were the crosses a place of worship for our ancestors, but they were a stopping place for those making the long journey into town. It was a place for the pioneers to stop and thank the Lord that he saw them that far into a journey. It was also a place for settlers to meet and to plan (e.g., meeting to organize a barn raising, etc.) and to pass on information and the news of the day. From the Opeongo Line where the first Kashubian pioneers settled, northward to the Hamlet of Wilno, and up to the Paugh Lake area you can still see some of these crosses; the symbol of how strong and how important faith was to our ancestors. It has been noted that there were approximately 20 crosses erected originally in this area. With the exodus of the young from the farms in the 1950's, many of these crosses decayed and were never seen again. There are currently only 6 original pioneer crosses still standing in the Wilno hills and two modern crosses which were erected more recently. One of these modern crosses was erected by Fr. Wilowski in 1933 and stands proudly atop Shrine Hill.This cross now has been replaced with a new one and the original is now at a open air museum in Szymbark, Kashubia. It was shipped to Kashubia Europe by Daniel Czapiewsczi the owner of the museum. It is important that our generation remember the hard lives our ancestors lived. 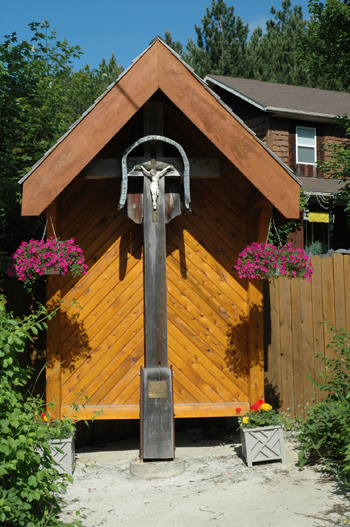 It is important to resurrect the crosses of Wilno and with them the strong faith of our forefathers. Our enjoyment of this great land we live upon today is possible only because of the hard work and the strong faith of our pioneer ancestors. It was their faith in God that kept them going through difficult terrain and even-more difficult economic times. We must do what we can to keep that faith alive. THE STRENGTH OF A PERSON LIES WITHIN THE STRENGTH OF THAT PERSON'S FAITH. # 1 Corner of Paugh Lake Rd. and EtmanskieRd. This cross was erected by Joseph and Mary Dudinski, passed down to Steven and Dominica Yantha, then to Vincent and Anges Golka, Joe and Victoria Dombroksie and family to Victor and Jean Shulist. It is now maintained by the Shulist family. #3 Corner of Wilno North Road and Murack Flis Road. 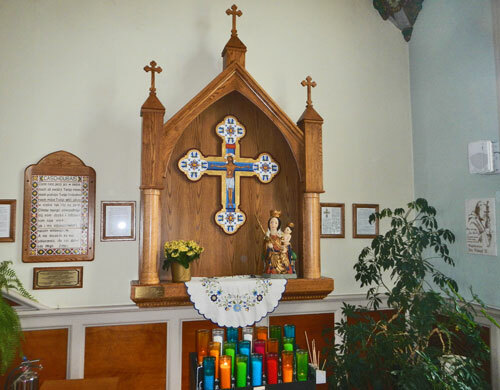 This cross was erected by Martin and Stacia Recoskie, passed down to Lornie and Catherine Recoskie then to Raphael and Dorthy Smaglinskie who are present caretakers. #4 Corner of Old Wilno Paugh Lake Rd. ( Wilno North Road) and Con.10 (Peplinskie Homestead Rd.) This cross was originally erected by August and Helen Shulist, it was passed down from them to Vincent and Ludwiga Shulist and is now under the care of Adam and Stacia Shulist and their son Joe. 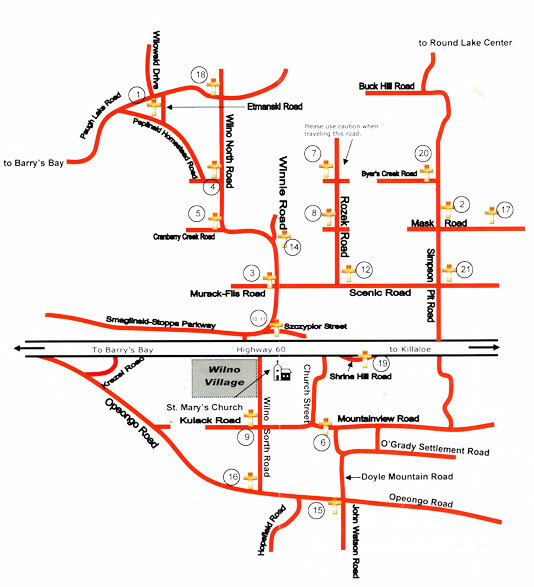 #5 Corner of Old Wilno Paugh Lake Rd ( Wilno North Road) and Cranberry Creek Rd.. This cross was erected by Frank and Rose Yeretch, passed down to Maxie and Mary Recoskie then to David and Diana Shulist who maintain it today. #6 Corner of O’Grady Settlement Road and Mountain View Rd. This cross was erected by Paul and Victoria Yantha then passed down to John and Katie Yantha, Tom and Elizabeth Yantha and finally to Frank Yantha who maintains it today. Three crosses erected on a hill depicting the Calvary scene were established in 1996 by the Trebinskie Family. This beautiful display is located on the Wilno North Road between Con 10 and the Bonnechere Rd. Iron Cross from the top of St. Stanislaus Kostka Church. It is the only thing that was savaged from the fire in 1936. Martin Shulist saved it from going into landfill. Original Cross from 1933 on Shrine Hill now proudly displayed at Daniel Czpiewsczi Heritage Park in Szymbark, Kashubia.